GarageBand includes a Songwriting project you can use to add tracks on your MacBook (also available from the top-level New Project dialog). When you choose the Songwriting project, GarageBand presents you with a full set of four instrument tracks, plus a real instrument track for your voice. You’re instantly ready to start adding loops and recording your own voice! You find no keyboard. You can record the contents of a software instrument track by “playing” the keyboard, clicking the keys by tapping your trackpad. If you’re a musician, the best method of recording your own notes is with a USB MIDI instrument. For now, you can display the keyboard window by pressing cmd+K. If you don’t need it, banish the window by clicking the Close button. Even if you’re not interested in the point-and-click keyboard, GarageBand offers a musical typing keyboard, where you press the keys on your keyboard to simulate the keys on a musical keyboard. (Hey, if you don’t have a MIDI instrument, at least it’s better than nothing.) To display the musical typing keyboard window, press Shift+cmd+K. The example song has only one track. If you want to write the next classical masterpiece for Grand Piano, that’s fine. Otherwise, on the GarageBand menu bar, choose Track→Delete Track to start with a clean slate. Software instrument tracks: These tracks aren’t audio recordings. Rather, they’re mathematically precise algorithms that your laptop renders (or builds) to fit your needs. If you have a MIDI instrument connected to your MacBook, you can create your own software instrument tracks. Electric Guitar tracks: GarageBand includes a real instrument track, especially made for an electric guitar, that allows you to use one of five different amplifiers and a number of stomp boxes (those effect pedals that guitarists are always poking with their foot to change the sound of their instruments). Podcast artwork track: You get only one of these; it holds photos that will appear in a video iPod (or a window on your website) when your podcast is playing. Video tracks: The video sound track appears if you’re scoring (adding music to) an iMovie movie. Along with the video sound track, you get a cool, companion video track that shows the clips in your movie. Click the Create a New Track button (which carries a plus sign), labeled. 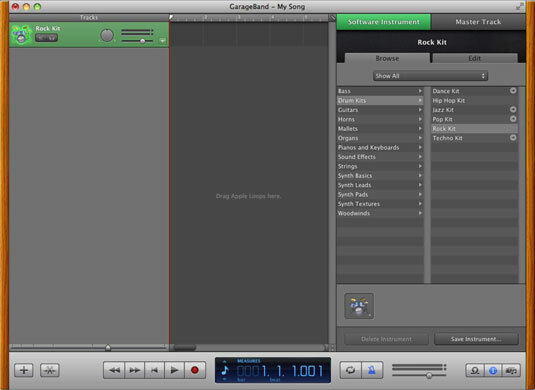 GarageBand displays the New Track dialog. Click the Software Instrument radio button, and then click Create. See all those great instruments in the Track Info pane on the right? Select the general instrument category by clicking it. From the right column, choose your specific style of weapon, such as Rock Kit for an arena sound. Click the View Media Browser button. GarageBand displays all the photos in your iPhoto Library and events. Drag an image from your iPhoto Library in the Media Browser to the Track list. The Podcast track appears at the top of the Track list, and you can add and move images in the list at any time, just like the loops that you add to your instrument tracks.